I have been avoiding over-value STI index component stocks and just investing in penny stocks with short term momentum. Sunning Tech has been active with good volume recently and expect the company to turn into black pending for the last quarter financial report announcement. Using Standard Six Technical Analysis Method to analyse the stock momentum. Moving Average (MA) – stock price above 20D, 50D, 200D MA lines. The worst crisis has gone. Economy seems to have bottomed up and the fear factors are no longer there. The company expect to make profit again after in the red for so many quarters. The company is still generating positive cashflow base on Q109 financial result. WORST CASE: If all my Technical Analysis are wrong, I just keep the stock and wait for the price to go back to the fair value. I still be able to make money if I can hold the stock long enough. Chartered has a nice uptrend wave with a solid Fibonacci fitting! I am still losing money with Chartered shares. Besides waiting for the semiconnductor manufacturing recovery, the beautiful wave shown by CharteredSc tell us some story. 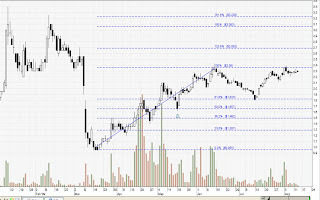 In addition, the stock price retraced back to 61.8% which is a solid Fibonacci retracement level. 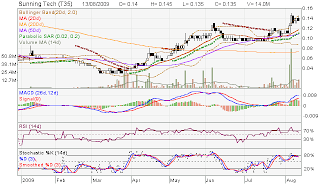 I should have bought more shares when the share price at $1.80. Frankly speaking, I was panic when it hit $1.80 and worried that whether the stock price will go lower WITHOUT looking at the chart (another lesson learnt for not analysing the chart constantly!). I am waiting for a big correction to happen before I invest this stock again. Isn’t it a good stock to monitor as the company is going to be profitable again in the next one or two quarters and the chart is showing us a very nice wave? It looks more predictable on the stock price now. Looking back, one of the mistakes I made previous was to buy IPO stocks. I still can remember using ATM to subscribe IPO stocks that I did not even know what is the company is about. The impression I had last time was it was very easy to make money from the IPO offering. You subsribed the share for $0.10 and the 1st trading days it would shoot up to 100%! It was the easy money, wasn’t it? However, we would never go and sell the share as our greed told us that it would go higher and higher and made money $$$! At the end of the day, the price would drop back to even lower than the IPO price. I have lost money with Del Monte, Dynamic, Giant Wireless, Valuetronics and Eastgate that my record is almost 100% (LOSING MONEY!!) I have got rid of Del Monte and Dynamic two weeks back and still holding Valuetronics. Lessons learnt: Do not anyhow buy IPO stocks unless you are VERY VERY SURE it is a good company with very good business prospective and fundamental. Anyway, it is always a gamble to buy IPO stocks as there is no historical data for us the assess the stock price. It can make money very fast and also make us lose money as fast!